For many families looking to plan their first Disney vacation one common question that arises is: should we go to Disneyland or Walt Disney World? For some groups location will be a big deciding factor in which park they want to visit. But for other groups they may be looking specifically for attractions only found in one of the parks or certain historical features. Why Wait to Save? Disney Resort COMBO Hotel + Ticket Discounts Don’t let this deal pass you by! Book your Disney tickets and hotel through our recommended travel sponsor Get Away Today. MickeyVisit has negotiated the lowest prices on tickets and hotels so our readers can save as much money as possible. Book now! Our guide is here to help you see what the main differences are between Disneyland and Walt Disney World so you can effectively plan your Disney vacation. Sleeping Beauty’s Castle at Disneyland is considered iconic due its history as the first Disney Parks castle built. Disneyland is located in Southern California in the city of Anaheim. Disneyland was the first official Disney resort and opened in 1955. It was also the only Disney theme park that Walt Disney himself set foot in. Disneyland is about 50 acres in size with two theme parks and three on-site Disney Resort hotels. There is plenty to do in Southern California so if your family is looking for additional day trips outside the Disneyland Resort there are plenty of options. San Diego is home to other popular vacation destinations like LEGOLAND, Sea World, and the San Diego Zoo. You will find Universal Studios Hollywood located in Los Angeles which is about a 90 minute drive from Anaheim depending on traffic. To get to the closest beach from Anaheim you’ll be looking at about a 20 mile average distance and the travel time will vary based on traffic. Check out our guide to the best beaches near Disneyland to see the most popular beaches around the resort. Staying at Disneyland gives you some convenience with beach access which is a big plus for folks looking to venture outside the Anaheim area. Other popular theme parks, like Universal Studios Hollywood, are a bit further of a journey especially with the heavy LA traffic. As for the weather, you can expect more moderate temperatures and less humidity in California. It also rarely rains except for in the winter months. Walt Disney World is located in Orlando, Florida and opened after Walt Disney’s passing in 1971 although he did play hand in the park’s vision. The large scale of Walt Disney World makes the resort a town in itself which is part of the charm to many guests that stay on-site. Walt Disney World is 30,000 acres in size with four theme parks, two water parks, and more than 25 Disney Resort hotels and campsites. There are popular theme parks nearby Walt Disney World for families looking for day trips off-site such as Universal Orlando, LEGOLAND Florida, and SeaWorld. The driving time for these destinations vary with Universal Orlando and SeaWorld being the closet with only a 30 minute drive or less depending on traffic. LEGOLAND Florida is a bit further of a drive with an average time of about 90 minutes or less depending on traffic. The beaches are also bit further in driving distance from Orlando with an average of 75 miles away depending on your beach destination. See our guide here to our top four favorite beaches to visit on a Walt Disney World vacation. Hands down, it is most convenient to travel from Walt Disney World to Universal Orlando since they are only about 11 miles apart. For folks looking to combine theme parks, this is a large perk. Beach lovers will be bummed to find out that reaching the beach is a bit more of a longer trip though. When it comes to weather, Florida is hotter and wetter than California especially during certain times of the year so it’s good to come prepared with easy to carry ponchos. There really isn’t a large difference when it comes to crowd levels. Gone are the days off an ‘off season’ period of time for either resort and really both are crowded year round now. You will still have higher peak travel times of the year like summer break and holidays that can feel a bit more intense than others. Disneyland has a higher amount of Annual Passholders that make up the the population of guests year round while Walt Disney World relies heavily on tourists. We recommend looking at our crowd calendars for both Walt Disney World and Disneyland to get an accurate idea of what events might influence the crowds. Overall, the cost for both Walt Disney World and Disneyland is remarkably similar in ticket prices and hotel costs with a few exceptions. Because of Walt Disney World’s size and the two water parks it offers, guests may opt for longer visits when planning a vacation which will drive up cost in terms of ticket, hotel stays, food, etc. Over at Disneyland, the cost of staying at an on-site hotel is much more expensive since there isn’t such a large variety of Disney Resort hotels. But guests that wish to save money in that area can also opt for many of the local area hotels instead which are often even closer to the gates. To keep your vacation price down, we recommend getting discount tickets for Walt Disney World here and Disneyland here. Disneyland has three on-site Disney Resort hotels with one having its own access into one of the theme parks. These hotels are pricey but are quite popular. Disneyland is such a large part of the city of Anaheim many guests choose to stay off-site since many of the Good Neighbor Hotels are just as close, if not closer, to the gates as the Disney owned hotels. The main perk of staying on-site at Disneyland is the early entry option of Extra Magic Hour, Disney themed ambiance, and esteemed customer service. See our guide to Disneyland hotels here to see our reviews, guides, and recommendations. 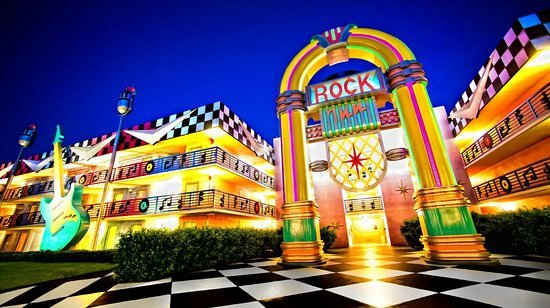 Walt Disney World All-Star Music Resort – one of the value hotels at Disney World. Walt Disney World is really a city of its own with the sheer size combined with theme parks and hotels. Many guests stay on-site at Walt Disney World due to the convenience and perks of staying in a Disney Resort hotel. Disney hotel guests will get free transportation from the Orlando airport to their hotel, free transportation around the resort, and Extra Magic Hour early entry. Due to the large variety of Disney Resort hotels there are hotels that are just as affordable (called ‘Value’ hotels) as off-site options making it much more accessible for families to afford the Disney owned hotels. See our complete guide here to hotels at Walt Disney World. Peter Pan’s Flight- a classic attraction offered at both resorts. Walt Disney World has four theme parks and two water parks. The four theme parks are Magic Kingdom (this is where you will find Cinderella’s Castle and classic rides); Animal Kingdom (find the animal safari and Pandora here); Epcot (find the World Showcase and the Frozen ride here) and Hollywood Studios (this is where Toy Story Land is and Star Wars: Galaxy’s Edge will be). The two water parks are Disney’s Typhoon Lagoon Water Park and and Disney’s Blizzard Beach Water Park. Expedition Everest is an unique attraction to Walt Disney World. Despite the difference in size, Disneyland actually has more rides than Walt Disney World does! To calculate this, I excluded animatronic shows/entertainment experiences and focused primarily on rides where you board some type of vehicle including the Main Street Cars (offered at both parks) and what would be defined as a ‘regular’ ride experience. I also did not include the rides/slides offered at the Walt Disney World water parks or any of the Disney Resort hotels at either location. This is usually a surprising number for many guests so the next question naturally asked is: what takes up all that space at Walt Disney World then? There are a significantly larger amount of dining and shopping experiences at Walt Disney World in addition to other entertainment experiences that are larger in scale and nighttime spectaculars. The attractions at Walt Disney World are more spread out than they are at Disneyland which also makes a difference when it comes to available space. This also changes the ambiance of both parks and guests will vary over which they prefer. Some guests find Disneyland’s closeness easy on the feet and Walt Disney World’s larger space more exhausting. While other guests may find Disneyland more claustrophobic compared to the space at Walt Disney World. It is really a personal preference. Now keep in mind that many of these attractions are shared attractions that both resorts offer. Some versions are a bit different than each other. For example, Pirates of the Caribbean is a much longer experience at Disneyland compared to Walt Disney World. On the flip side, the Jungle Cruise is a longer experience at Walt Disney World than it is at Disneyland. But regardless, you can find all the classic rides (Peter Pan, Space Mountain, Haunted Mansion, its a small world, etc.) at both resorts. Indiana Jones Adventure is an unique ride to the Disneyland Resort. What guests really look for when comparing attractions is the amount of unique attractions to each resort. Here I made a list for each Disney resort with their unique attractions that they offer. Disneyland does come in with the higher count of unique attractions compared to Walt Disney World using my definition of attraction above and does not count certain experiences, shows, etc. Many of these unique attractions on Disneyland’s list total up quickly with the large size of their Fantasyland as some of Disney’s earliest attractions. And of course, both Disneyland and Walt Disney World will both offer Star Wars: Galaxy’s Edge with each resort’s land being nearly identical to each other. Due to its sheer size, Walt Disney World has a much larger variety of dining options and offers prepaid dining plans. Disneyland has a few coveted dining locations though and they are not to be overlooked. Disneyland has five character dining experiences with one being a higher end princess experience. All of these character dining options, with the exception of one located in Disneyland, take place at the Disney Resort hotels. Read more about Disneyland’s character dining here. In comparison, Walt Disney World has fifteen character dining experiences with seven taking place inside the Walt Disney World resort theme parks and the rest at Disney Resort hotels. There is a larger variety of options with fine dining, Princess focused experience, and a variation of themes. Hands down, the most cultivated experience is the Cinderella’s Royal Table Character Dining experience that takes place inside Cinderella’s Castle in Magic Kingdom. Read more about Walt Disney World character dining here. The Blue Bayou in Disneyland is located inside the Pirates of the Caribbean attraction. Walt Disney World’s size gives them the upper hand to offer many more dining options than Disneyland can offer. There are a few key favorites at Disneyland due to their history such as the Blue Bayou located in the Pirates of the Caribbean attraction, the Carnation Cafe as one of Walt’s favorite dining options, and the Plaza Inn which was decorated by Walt’s wife Lillian. Definitely do not miss those historical experiences if you’re making your way to Disneyland. Check out our full guide on Disneyland dining here. As for Walt Disney World, there is a larger variety of fine dining options along with many quick-service options. You can also book a dining plan in advance and prepay for all your dining for your vacation. Disneyland does not offer a dining plan- this is a key difference in dining between the two resorts as well. Check out our full guide to dining at Walt Disney World here including information on dining plans. Disneyland’s first female pirate, Redd, roams New Orleans Square. One of the greatest differences between Walt Disney World and Disneyland is the way they handle their character meet and greets. At Walt Disney World, characters are often designated to one location and you may want a FastPass to avoid standing in long lines to meet them. At Disneyland, some characters have designated meet locations while many others wander around the park at random with or without a Cast Member. If meeting characters at Walt Disney World is a priority, advance research is a must. Rivers of Light is a nighttime spectacular unique to the Walt Disney World resort. When it comes to live stage shows, Walt Disney World offers a greater number of options than Disneyland. This is also part of what makes up that size difference between the resorts even though they have a similar amount of rides. As for parades and nighttime spectaculars, the resorts typically average the same amount per day with a greater variation being in the parades or nighttime shows themselves. There are many parades that are unique to each particular resort so you will see different parades depending on which resort you visit. These parades change often depending on seasonal celebrations so it’s best to check the official website for each resort. The nighttime spectaculars also vary with Rivers of Light being unique to Walt Disney World and World of Color being unique to Disneyland. So you will also likely experience different fireworks shows and nighttime spectaculars at both resorts with Walt Disney World having more nightly experiences. These nighttime spectaculars change often as well so I recommend checking the official website for each resort before your visit. There is also a greater number of stage shows and live entertainment of that nature at Walt Disney World, again due to its size, so if stage shows are high on your list that’s a consideration to keep in mind. Mickey’s Once Upon a Christmastime Parade at Mickey’s Very Merry Christmas Party in Walt Disney World. In terms of seasonal celebrations, both the resorts have celebrations for many of the popular holidays. There are just a few differences in how these events are run and priced. Disneyland’s holiday season celebration doesn’t require a party ticket in addition to regular admission to view the Christmas Fantasy Parade, the holiday fireworks, and other holiday themed events. Over at Walt Disney World, guests will be required to purchase an additional party event ticket to Mickey’s Very Merry Christmas Party to experience similar Christmas themed entertainment. There are pros/cons to both approaches. Some guests like the ticketed option at Walt Disney World as a way to control the crowds during an already busy time of the year. But some guests prefer the no additional cost approach that Disneyland utilizes for their holiday celebrations. You can read more about the holiday season at Disneyland here and at Walt Disney World here. When it comes to Halloween both Disneyland and Walt Disney World require an additional party ticket with regular admission to enjoy the nighttime festivities so the experiences for this holiday tend to be quite similar. One benefit Walt Disney World has is its size with three other parks to visit so guests that don’t have a party ticket have a larger variety of places to go when the party starts. At Disneyland, however, guests are just limited to California Adventure which can make that park much more crowded during the Halloween season. Haunted Mansion Holiday at Disneyland- this theme lasts through the Halloween and the Christmas season. One key difference Disneyland has in comparison to Walt Disney World for the holiday celebrations is the amount of attractions that get temporarily re-themed for the celebration. For example, at Disneyland the Haunted Mansion gets A Nightmare Before Christmas overlay and is transformed into Haunted Mansion Holiday at the start of the Halloween season and stays up throughout the Christmas holiday celebration. Walt Disney World does not re-theme any rides (with the exception in the past of the Jungle Cruise but it’s unsure if that will happen again in the future) for the holidays which can make Disneyland a big draw in that area for guests. Other attractions to receive the holiday treatment at Disneyland for Halloween/Christmas are Space Mountain, Luigi’s Rollickin’ Roasters, Mater’s Junkyard Jamboree, and it’s a small world. Both Walt Disney World and Disneyland are cherished places for many guests despite how often they are ranked against each other. In my opinion, they both offer their own unique charm and joy to any Disney Resort vacation. Instead of picking just one, why not plan two trips? But if this is a once in a lifetime trip for your family, taking into account all the key differences shared in this guide should help you plan the vacation that is the right fit for your group’s interests. Plan Your Disney Resort Vacation!